Click on the graphic below for help on the options categories or scroll the screen down for a text description of the Display options fields. Number of items to save: Select the maximum number of items to save in the Search String, Replace String, Mask, and Path drop down combo list boxes ( ) next to the input fields on the main dialog. Auto-Complete Combo Boxes: Check this to enable “fill-as-you-type” for the Search, Replace, File Mask, and Path fields in the main dialog. When enabled, if you type characters matching a string in the history list for that field the entry expands automatically. Found Color Button: Choose this button to display the Color dialog, which you then use to select a new color for the found strings in the list. 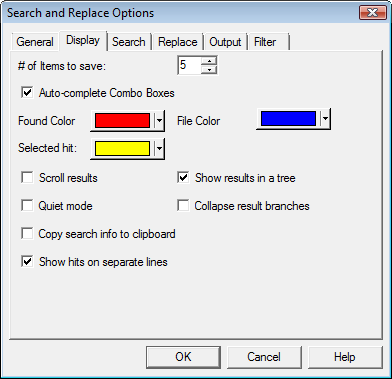 File Color Button: Choose this button to display the Color dialog to select a new color for the file names where the strings were found. Selected Hit: Activates a Color Dialog to change the color to use for the selected hit. Adjustments here can be helpful if you are working on a LCD display and the standard highlight color obscures color used the search hit. Scroll Results: When enabled the Search Results List scrolls automatically as an operation is performed. Quiet Mode: Silences all error messages. This is for advanced use only. Use this when you are very sure you do not need to see warnings about replacements in binary files or file locking reports. Enable this only if you are sure you need it! Remember, some error messages are useful! We suggest you use it for specific tasks and then return the program to normal mode when you are through with that task/project. Show Results in a Tree: Enable this to activate the tree style in the Search Results list. Collapse Results Branches: When enabled the initial search results tree appear in a collapsed state. You can expand it with the mouse or one of the keyboard shortcuts. Copy Search Info to Clipboard: By default, if one or more lines are highlighted in the Search Results list and Ctrl+C is used to copy to the clipboard, the program includes information about the Search/Replace strings, Mask/Path, and special settings. Uncheck this switch to copy only the highlighted lines and not include details about search parameters. You may need to restart the program for changes to take effect. This switch has a similar impact on the material included in the output report (if enabled). See Options|Output. Show Hits On Separate Lines: By default, each hit is shown on a separate line in the search results. When disabled, if there are multiple hits on a line the line is listed only once.